go the extra mile. it's worth it. here’s a shorter version of the december 2015 time-lapse video i posted the other day..
what a beautiful evening it was tonight at the flowering heart center in clearwater. there was a smaller group yet the blessings were powerful. i really felt my heart open while receiving one. it was nice to briefly share my experience afterwards and tell her it was powerful. it's funny, i had wanted to tell her though was putting the chairs away and then she happened to come by and help with the chairs, and i was able to naturally and effortlessly share what i had wanted to, and she seemed to appreciate it. it was nice to make a little connection. it was nice seeing everyone chatting afterwards too. the community feels more like home and family as i open my heart, and it's really beautiful. i had thought earlier of stopping to take some shots along the road on the way home though wasn't quite feeling it. i felt more inspired to create this photo with a wider view of the sky and trees rather than the busy road. its great to learn to trust your intuition and divine guidance. back in august i started thinking about selling my custom rig to shoot 360x180 degree time-lapse photos, though had thoughts about still wanting to keep it to be able to create long exposure 360x180 timelapses, despite not having used the rig in years. the day after the motor and custom panorama head arrived at the dealer i was selling it to Ricoh announced the latest version of their 360x180 degree camera, the Theta S, and it had the capability to do long exposures!! trust your feelings. the divine is always guiding you perfectly in the direction you are meant to go. sometimes it takes a leap of faith to step into an unknown and often as soon as you do that you’ll find what you’re looking for on the other side. i pre-ordered my Theta S a couple weeks ago and it just arrived in the mail today. 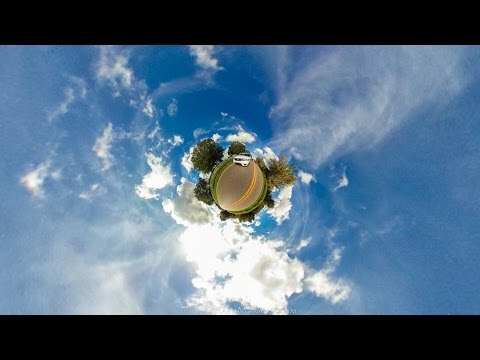 here’s the first long exposure “little planet” i’ve shot with it. i look forward to creating night little planet time-lapses with this camera. i’m so grateful for no longer having to carry around such a heavy rig to be able to create these images! faith and perseverance with an element of surrender go a long way in manifesting your reality. i started researching and developing ways to create this sort of image 6.5 years ago and never imagined it’d be so simple to be able to create this unique look back then. once i experimented, designed, and got my custom rig working, i did start to envision being able to have a simpler way of creating the time-lapses though saw any sort of camera system that could do so either didn’t exist or would cost as much as a small car. letting it go and forgetting about it for a while created the space for it to show up years later! the emotional roller coaster, oh what a ride it can be. some drops subtle, some turns unexpected, though all a part of the journey of embracing and releasing what no longer serves us and waking up to what is. much like nature that continues to grow and recycle what it no longer needs throughout the seasons. so much peace and harmony can be found going to nature and simply observing its beauty or feeling its peaceful presence. it fully accepts the moment without resistance. here’s my latest masterpiece… err, well, really more of an experimental, proof of concept piece than a so-called “masterpiece”. there are some places where this could be better and i could continue to refine this though i’ve decided to leave it as it is. technically, there are a few errors due to buggy software [adobe photoshop, ffmpeg, and quicktime player pro all seemed unable to support the size of this project.. it was 18361 still images with the final tiff files taking over a terabyte of space before rendering the 4k uhd 2160p video], colors could be improved, the time-lapse film/movie/video could be edited down to something shorter, some of the little planets could be centered better, etc, etc, though part of the concept behind all of my work is to expand perspectives [and after working on putting this together for weeks, i’m finally calling it done, at least for now]. so many of us seek perfection, especially technical perfection in the photographic, or lens-based arts, and yes very beautiful works can be created with enough effort, though this same quest for perfection can drive one insane and keep pushing one further into the mind, and the mind’s desire/need for perfection (or need for more/better/newer/faster/etc). the underlying message in my work is to let go of one’s own self-limitations. let go of what no longer serves you. expand your mind, your viewpoint, your self, to new limits. when letting go of the limitations of the mind, one will discover a whole new reality in this experience called life. one will discover a deep sense of peace amidst the chaos. life truly happens outside of the mind and its attachments/desires. step outside of yourself. expand your way of seeing the world, your self, others, and life to a new level. there is beauty everywhere, we just need to learn to see it. and it’s done by letting go rather than struggling, striving, and yearning for more and more. when letting go, inspiration easily comes to you. in this place of silence, from a deeper place of silence, ideas and feelings emerge. things don’t have to be so complex either. start small, or work in small increments, and you can do something big. with the car rig shots, i drove quite slow during the first shots (both to make sure the rig held up before incrementally driving a little faster with it, and to have more shots in the time-lapse as the minimum interval timer setting available on the camera was not ideal). a lot of this is common sense and one who has done something similar before will see this as a simple, effective, logical way to approach creating something, though i realize, and have seen, that not everyone thinks of this sort of technical approach when creating something or trying something new. it really seems to be about a balance between feeling and thinking, between inspiration and logic, just like photography is a balance between science and art — one could get by with either approach, though when combining both, one can create (and live) in new ways. this balance, or way of understanding both/all sides, is part of the whole underlying message of expanding perspectives. by being able to see, understand, and feel one way or the other, one can remove limitations in one’s life. spiritually, or philosophically (or whatever you want to call it) looking at this, it’s more of a non-dualistic approach. as we learn to transcend the limitations of duality, we embrace oneness. in oneness, we see that everything is connected and there is no right or wrong, no good or bad, and no separation. everything is part of the whole, and needs to exist in order for us to have this experience we call life. without up we cannot know what down is. without good or something we desire, we cannot know what bad or something we resist is. 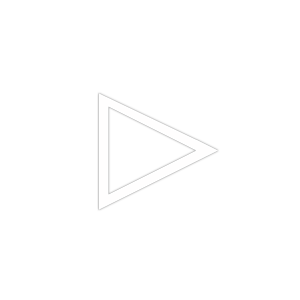 these dualistic perspectives give us the ability to experience life from a single viewpoint or perspective of separation, though as we learn to understand the whole, and see everything/everyone as connected and somehow related to everything/everyone else, new doors of perception will open to us. our current understanding through a vantage point of duality, is caused by existing and perceiving through the limitations of the mind. 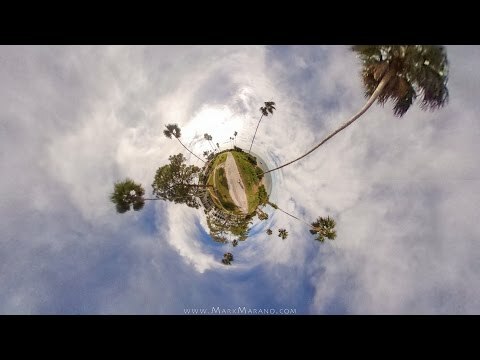 as we awaken and transcend the limitations of the mind, we begin to see the world as it is — before awakening, when perceiving through the mind, we are seeing a filtered world — we are not seeing it as it is — our viewpoint is clouded by programming/conditioning/judgment that we have been taught since we entered this world. we are told this is where we begin and this is where we end — anything outside of this defined endpoint is not us or ours, and anything within is us or ours. separation and conditioning is taught. the separate self, the ego, is a learned concept. yes, it is part of our current human experience, though it is also the root cause of all suffering. when we learn to see that we are all one, our lives will heal. we’ll also begin to see that there is no past or future.. these are merely concepts the separate mind has been creating. some concepts can serve us in various ways though many limit us. as we realize none of what we thought was real actually is real, we can much more easily let go of any attachment and suffering. we’ll find a place of bliss and peace when we can live fully in the present moment, in the now, and let go of thinking things need to be a certain way or cravings for what we don’t have or resistance of life circumstances we are experiencing but prefer not to. fully embrace the present moment. let go of anything that is not here and now. it is not real. your thoughts of the future, past, desires, resistances, etc, etc are only preventing you from fully living today, here and now. “carpe diem” seize the day, today and every day. do not dwell upon what is not. yes, you can vision, create, and manifest your future, though you must also let go, and surrender, to the present moment of where you are now in order for the creation to manifest. if there are any hinderances in thoughts, feelings, etc, etc preventing you from experiencing that which you desire, you will be taken through those so you may fully experience and release them and create the space for what you do desire to manifest and unfold simply in your life. the more we let go, surrender, and experience, the simpler this whole process becomes. the more we let go, the simpler life becomes. and the more we let go, the simpler it becomes to perceive and understand and fully know who we truly are (and all of the seemingly magical or mystical perceptions and understandings that come with this). life is beautiful. live it fully. today. every day. here and now. let go. embrace. live. step outside of yourself. awaken. become aware. understand by perceiving [what is]. grow. expand. be. 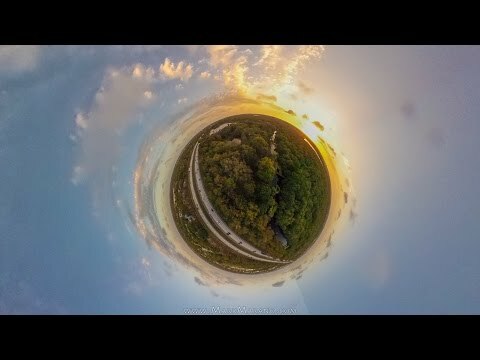 over the years since i first posted my little planet timelapses online, i’ve received a number of inquiries as to how they were made (as its a very unique look and i believe i was the first to create them). the first step is to gather the series of equirectangular images.